“Without cooling, most modern society would crumble,” warns Captain Pawanexh Kohli, cold chain expert and chief advisor of India’s national centre for cold chain development. In the UK especially, we currently import 50% of our food, so refrigerated vans with effective temperature control are essential. These extend the lifespan of fragile products that would otherwise perish during long periods of transportation. However, different cold chain products require specific conditions, and therefore need specialised refrigerated vans to ensure the safety of the end user. Ineffective transportation of raw meat and fish has the potential to cause illness and even death. These types of cold chain products naturally contain microorganisms that can harm consumers if health and safety measures aren’t put in place. Optimal temperature control can help to reduce or even eradicate bacteria. In order to minimise the decay of organic products, a heavy chill compartment should be used, enabling couriers to maintain temperatures below freezing. When transporting raw meat and fish alongside ready-to-eat produce such as fruit and veg, a multi-compartment van is essential. Cross contamination is a serious problem that continues to plague the food industry. Deadly bugs such as E. Coli have the ability to survive harsh conditions, while also having a very low infective dose. It’s therefore essential that raw products are wrapped, packed and securely stored away from ready-to-eat products in order to minimise contamination risk. If your refrigerated system fails, meat and fish products can be compromised in a matter of hours, especially during warm summer days. We therefore offer refrigerated units with stand-by functions to ensure that cold chain products aren’t compromised. To ensure as little disruption as possible, we hold a ‘keep you on the road’ philosophy, with breakdown support available 24/7, 365 days a year. This helps to ensure that your refrigerated vans are fully operational in no time. Chemical reactions and respiratory processes continue to take place in fruits and vegetables, even after harvesting, making an effective ventilation system essential. If a ventilation system isn’t in place, fresh produce can lose its water content, leading to under-ripe or even inedible fruit and vegetables. 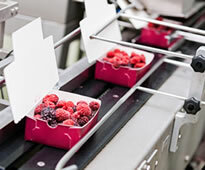 Fruit and vegetables can be extremely delicate, requiring precise temperature control. Couriers need to achieve a fine line between delaying the decay of these products, and killing the living tissue. Just a degree below a specific fruit’s chill point can cause irreversible damage, rendering these products unsuitable for sale. Optimum temperatures vary considerably depending on the particular product. For example, an apple’s recommended temperature is between 1.5°C and 4.5°C, while that of a banana is between 13°C and 14°C. As a fruit and vegetable courier, you may be required to frequently adjust the temperature of your refrigerated compartments. All of our new refrigerated vans come equipped with state of the art transcan recorders, placing temperature control directly in your hands, while offering full temperature visibility and accuracy. If you only require refrigerated vehicles on a temporary basis, you may be interested to learn more about our refrigerated van hire package. Simply hire vehicles for as long as you need, and return without any lengthy contracts or harsh penalties. Benefit from our wide range of refrigerated vehicles, from car derived vans to 26 tonne multi-temperature, multi-compartment rigid trucks. All of our new vehicles also benefit from the Transcan 2 temperature monitoring system from Seven Telematics, providing unrivalled temperature control. If you're not ready to hire just yet, but want to know more about refrigerated vehicles how to stay compliant with strict industry regulations, our free download: could be the perfect guide for you!